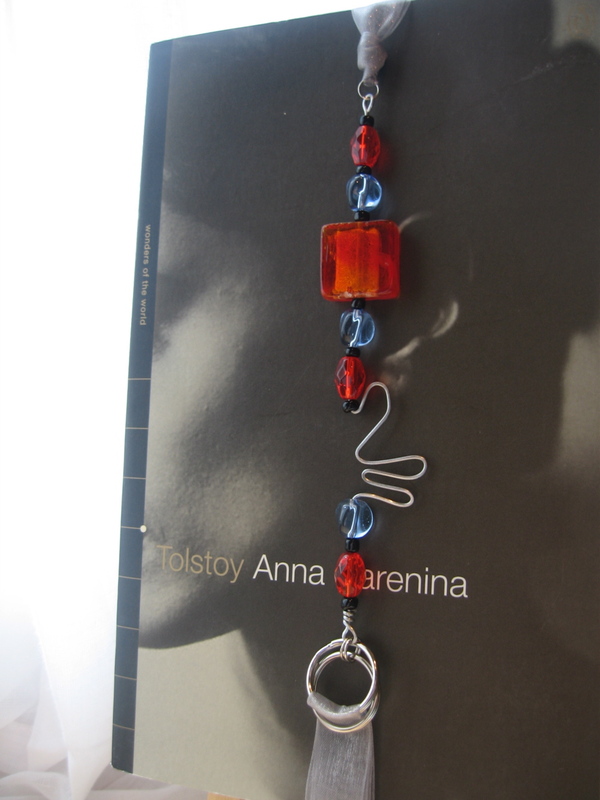 EleanorMac: Custom bookmarks and jewelry. Gifts that make their mark. I’m excited that spring is here and summer is around the corner! Here’s an update on where I have been and will be in the near future. 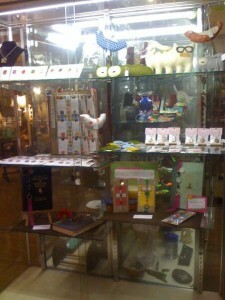 I’m pleased to announce I now have products available for purchase at Midland Arts & Antiques Market in Indianapolis, IN. Our case is to the left around the corner from the cash register. 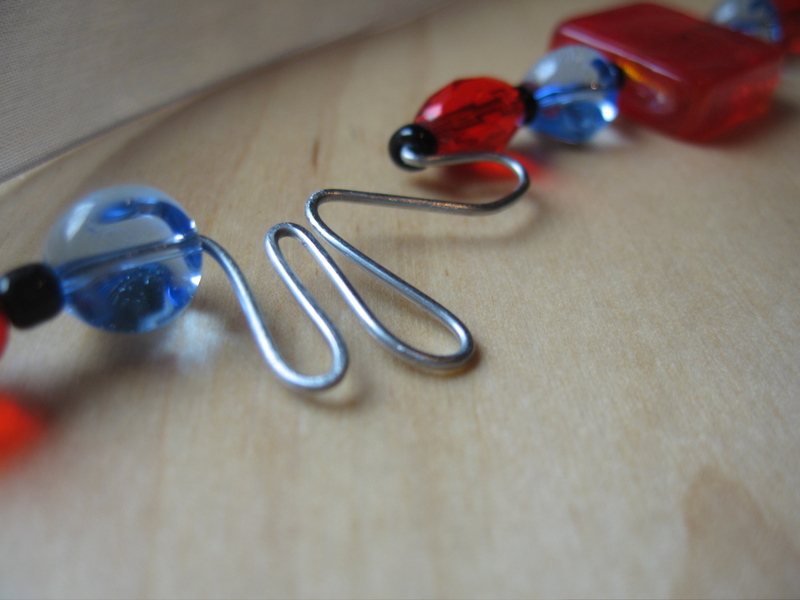 You will also find beautiful glass and Scrabble tile pendants created by Sunday Afternoon Housewife, as well as the most adorable Cat-erpillars and pendants created by Cordial Kitten. While our products don’t fall in the antiques category, we do hope you’ll have them for years to come! « Indieana Handicraft Exchange 6/13/09! 10/3/09 – INDIEana Handicraft Exchange – This is a fantastic group of local artists and crafters using traditional crafting techniques mixed with a contemporary edge. It’s a great feeling to be in the presence of so many talented individuals! The picture at right is from the event. 10/31/09 – INDIEana Handicraft Exchange “Mini” at Irvington Halloween Festival – 30 vendors from the IHE set up our tables in a huge tent during this festival. It was a chilly day but lots of fun in a great neighborhood. 11/14/09 – Lawrence Central Craft Boutique – This event featured over 100 booths, and a fleet of super nice volunteers. Great customers, too! So what’s up next for me? A break from shows and working from my Etsy shop. 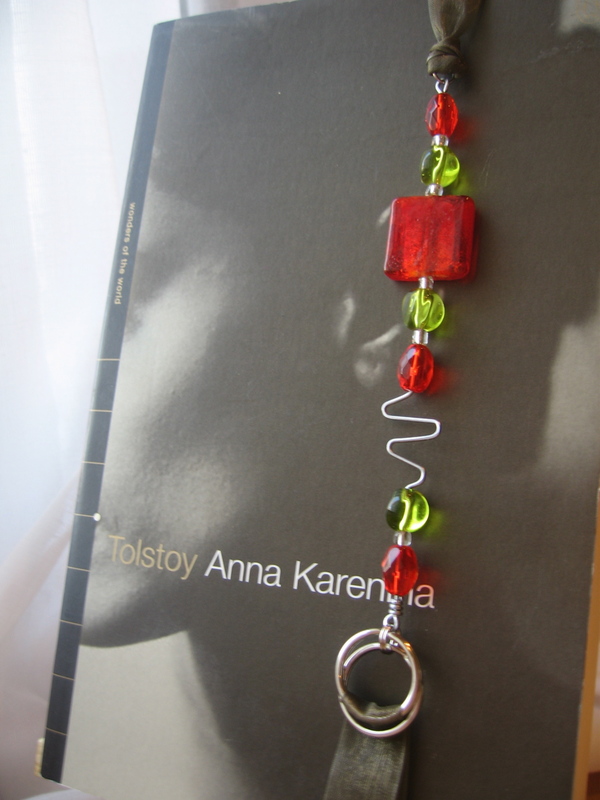 I’ll have Beaded Bookmark Belts and Planet Crayons posted to give you plenty of time to order for the holidays. The Bookmark Belts make excellent gifts alone or paired with a book or bookstore gift card. Planet Crayons are fun stocking stuffers. I also wanted to mention my favorite booth partner, Martha, of Sunday Afternoon Housewife. She makes beautiful jewelry using tiles from my favorite game: Scrabble! 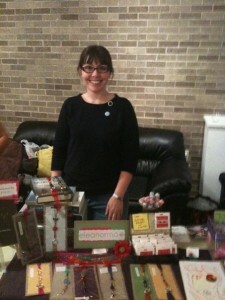 I will be at the Indieana Handicraft Exchange on June 13, 2009, 11 a.m. to 10 p.m. The event will take place at the Harrison Center for the Arts at 1505 North Delaware Street, Indianapolis, IN 46202, just north of downtown Indy. It will be held in conjunction with the Independent Music + Art Festival. Well, the 54th and Monon Art Fair didn’t work out as planned. The day marked some of the worst rain (and flooding in some areas) throughout the state. My mother-in-law was so kind to stay overnight in preparation for the big day and was positive throughout. We even held out hope in the morning despite the nonstop rain, thunder and lightning. In the end, I couldn’t risk having my items exposed to the, um, “damp” conditions. Nor could I risk exposing ourselves to the lightning while under a metal canopy! I admit, I’m slightly paranoid when it comes to lightning. I WILL be there next year. If they’ll have me, that is. I have since been busy with life, work, and trying some other creative ideas. 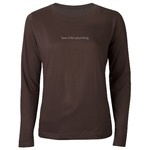 In the meantime, check out my CafePress.com shop. Sometimes a shirt or mug says it all. Or, go for the tote bag to get the message across while being a green citizen. I will have a booth at the Monon Art Fair next month. Stop by and say hi! When: June 7, 2008 | 10 a.m.-4:00 p.m.
70 local artist tents and shops; free hot dogs, lemonade, balloons & face painting; drawings for gift certificates at local restaurants. Maybe prepping our garden over the weekend did inspire me on the subconscious level. Naming my newest piece was easy…”tomato” came to mind instantly. The colors look summer fresh and good enough to eat. My favorite design yet! If you like the smell of garden tomatoes, I highly recommend Kitchen Tomato soap by Karen’s Soaps. It smells like the real thing and leaves your skin feeling soft. The grapefruit soap is also fabulous! Good news! 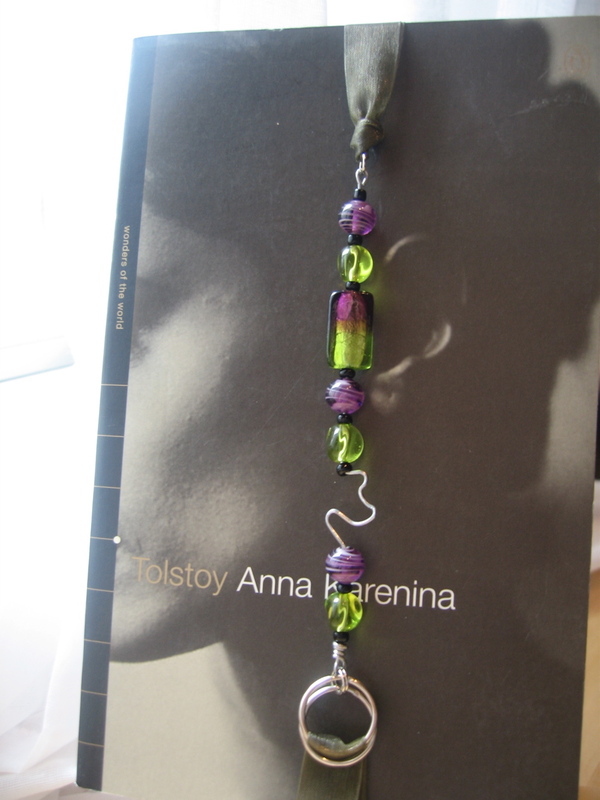 I sold my first bookmark on Etsy. I’m looking forward to shipping it off to its new home in Canada. 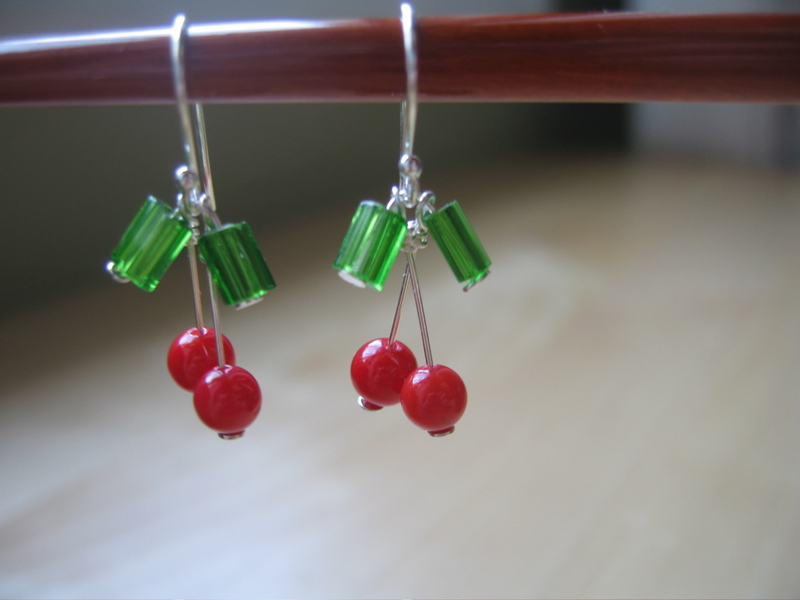 I added these fun cherry earrings to my shop today. They’re so bright and cheery that I almost kept them for myself! We finally got our son to sleep after a day of Easter festivities and I was ready to try a new idea for a bookmark design. Sketched image by my side, I spent the next hour or so putting the piece together. Everything went together as planned but in the end it just didn’t seem right. What was supposed to be a convenience factor in my design (a lobster clasp) actually became a hindrance. I took a break. At this point I was frustrated because I had just “wasted” an hour of precious time and I was now eating more leftovers than was necessary. I looked down at my husband’s book which had been used to try the new design. A snake is on the cover…not straight or curled up, but crooked. (Hence the title, Crooked Little Vein by Warren Ellis.) Anyway, that’s when it hit me and down went the fork. I had no choice. Another hour passed and I’m so pleased with the results. It was definitely worth the trial and error of tonight. 2. I really like adding texture to wire…either with curves or a file. 3. Not everything has to be uniform or symmetrical or even linear. 4. I should borrow more of my husband’s books for inspiration. 5. Inspiration can be a great calorie fighter.